President Trump's travel ban has been blocked by a federal appeals court. Transiting Pallas conjunct US progressed Sun and Pallas: the ruling reduces government coercion and is therefore "libertarian". Progressed Moon in Sagittarius conjunct US Ascendant: here come the foreigners? 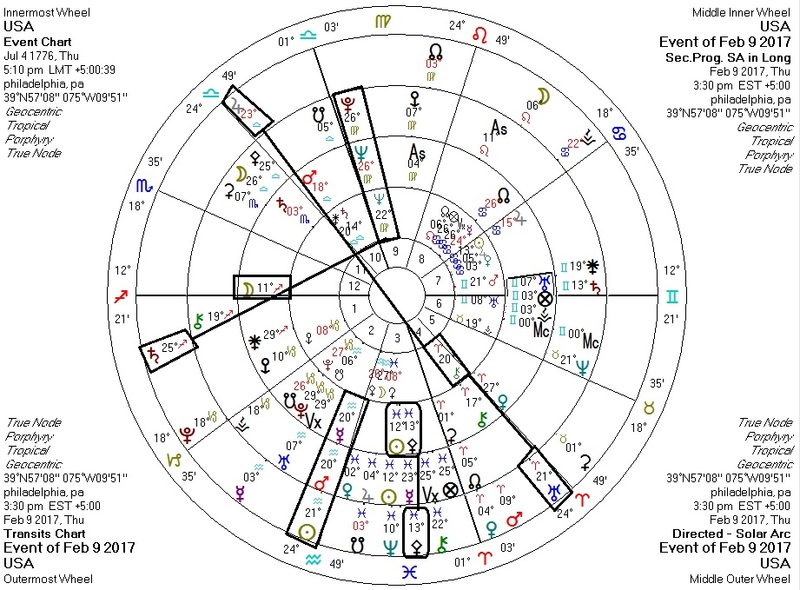 Transiting Jupiter and Uranus in aspect to US Fourth House Chiron: an unexpected boon to forces injurious to the homeland? or the healing of such forces? Transiting Sun in Aquarius conjunct progressed Mercury and solar arc Mars: combat in the societal arena via speech/language. Transiting Saturn in Sagittarius square US Neptune and solar arc Pluto: authority plus foreigners against US power and public image.